The art of classic stand-up comedy is still a thing! And one of today’s talented comedians lending to that style comes from the voice of Drew Thomas. For over 10 years, Drew has been treating the stage like his home, drawing his diverse audiences into a world of “face hurting” laughter with his quick wit and smooth delivery he gives accounts of relationship follies and keen retorts on everyday life. Originally a native of Kingston Jamaica, Drew migrated with his family to the U.S. at 9 view more.. Originally a native of Kingston Jamaica, Drew migrated with his family to the U.S. at 9 years old. Adjusting to New York culture was quite the adolescent challenge at first, but he soon made friends by defending himself through humor and honing his skill of “snapping" in his Bronx neighborhood. It was not much later, while listening to an Eddie Murphy comedy album in his friend’s living room that he envisioned himself becoming a stand-up comedian "one day". Years later, after being fired from his job as a car salesman in Atlanta and consistent nudging from a friend, Drew decided to "get off the couch" and finally give his childhood dream a shot. While pursuing a second degree in Theatre at Kennesaw State University, he convinced event organizers to let him open at their Valentine’s Day comedy show. Within a short amount of time, Drew went from winning a local comedy competition 3 months in a row, to honing his set and hosting at the infamous Phat Comedy Show at Twisted Taco and the legendary Punchline in Atlanta. In 2006, Drew was voted Best Comedian in Atlanta by Creative Loafing and soon after hit the road touring the country performing in 45 states, 40 plus weeks a year. His hard work has led to appearances on NBC's Last Comic Standing (Seasons 6 & 9) and The Late Late Show with Craig Ferguson, For 3 yrs Drew was the opening act on Rodney Carrington’s Laughter’s Good Tour playing countless theaters, arenas and casinos throughout the U.S. and Canada. Drew has also opened for notable musical acts such as Salt N Pepa, Boyz II Men, Chaka Khan, Al Green, Jeffrey Osborne, Tito Jackson, M.C. Hammer, The Temptations, Morris Day and The Isley Brothers, just to name a few. He's also appeared at over 75 Colleges and Universities. In addition to performing, he also produced two successful comedy series at California’s Morongo and Chumash casinos. 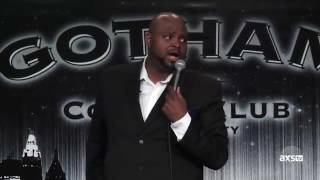 You can currently catch him on Gotham Comedy Live, Laughs on Fox and Comedy All Stars on Pure Flix or at a Comedy Club near you. His work ethic is above par and he continues to grow as an artist. He mentors young comics, does private comedy coaching, and still makes time to take acting classes and maintain a personal life.